Marketing: a disconnect between marketers and their customers, consumers? 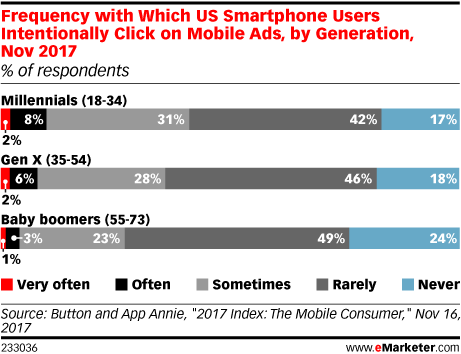 When looking at reports about where marketing is going, it’s very clear: mobile advertising is the rising star. But, let’s be honest, do you – as a consumer – like to get advertising on your smartphone? I recently asked this to a group of people and most were rather negative about mobile advertising… And this is just one of the disconnects I’ve seen between marketing and ‘real life’ over the past year. For a talk to a group of Xerox Premier Partners last week, I went through a large number of marketing studies. 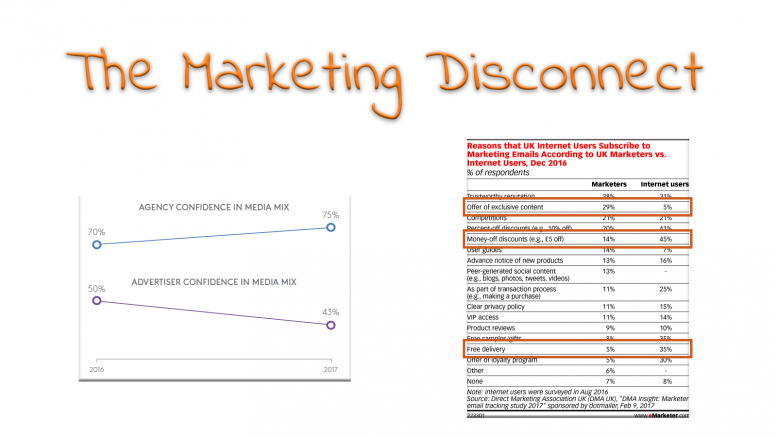 The disconnect already starts with the topic of most studies: they focus on marketing spending, not on the effect. So all that reports telling you that digital ads are rising, only tell you that marketers are spending more money on that. Not that digital ads are more effective. To know whether one channel has a bigger effect than the other, you need to compare them. And most reports only compare digital channels. Traditional channels, who are still very effective, are left out of the picture. “You can’t track traditional channels”, is often the excuse. But that’s not true. With a simple and clever trick you can track all channels: use a specific (short) URL for every campaign, and redirect that to a landing page, including UTM codes to get information about the origins of the visit. This way it ends up in the digital reporting system. Please check this tutorial to go hands on. BTW: you need to be careful when drawing conclusions from e-mail opening rates. The ‘trick’ to decide whether an e-mail is opened or not, is flawed. The only relevant parameter is whether a person has taken action: did he/she visit the website for further information, for a purchase. And we shouldn’t forget that a buying/selling process is always a ‘multi-touch’ process! You can not give all the credit for a sale to one specific marketing campaign or channel. According to some studies, the average car buying process involves 24 touchpoints! And not all of them are digital: advice from friends and family, newspaper ads, TV ads, a test drive, to name a few important ones. To get back to the disconnect: Kantar MillwardBrown asked both agencies and advertisers whether they had confidence in the media mix used (‘Getting Media Right’). The results are quite different: 75% of the agencies claimed they had confidence, only 43% of the advertisers had the same impression. 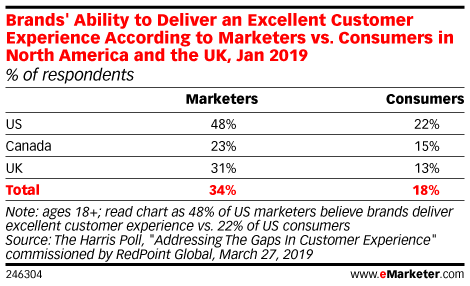 The Direct Marketing Association in the UK asked both marketers and internet users what the reasons are to subscribe to marketing e-mails. Marketers were convinced that the offer of exclusive was an important one (29%), while only 5% of the internet users agreed with that. For those internet users discounts, both as percent-off (41%) or money-off (45%), were very important. Marketers guessed discounts weren’t that important (resp. 20% and 14%). The disconnect is even bigger for free samples (35% for internet users, 8% according to marketers), free delivery (35% vs 5%) and loyalty programs (30% vs 5%). Why do people subscribe to marketing e-mails? The reasons mentioned show a disconnect between marketers and internet users. In a recent report on the effect of personalization on conversion rates (by Econsultancy & RedEye) agencies saw a much bigger uplift in conversion rates than their customers. With differences up to 24 points between their assessments of the assessment by companies. As a sidenote: the biggest uplift was for personalization in search engine marketing, the second biggest (according to companies) for offline: 37% saw a major uplift after personalization. This uplift shows the big potential of personalized print, when done right! When looking at social media, advertising has very little effect. The 2016 Nielsen Social Media Report showed that only 13% of heavy social media users had clicked on an advertisement within the last 30 days. The GWI report “The Social Media Trends Shaping 2018” shows that – even for 16 to 24 years old – a ‘buy button’ has almost no effect (4% to 13%, depending on the age, sees this as a purchase driver). And even ‘liked’ or ‘endorsed’ brands and products have a limited effect (13% to 25%). People do use social media for product research, but it’s for reviews and (real) recommendations by peers that have a significant influence, not hitting a ‘like’ button. So instead of focusing on the newest of the newest – just this morning I read an article how marketing should look at the opportunities of the Internet of Things – marketers should look at improving, perfecting the existing channels. Channels that have proven their value. And some companies are doing this. Some companies are bringing existing channels to the next level. E.g. Aldi, the German discounter. They are using ‘door drop’ materials on a weekly basis. Not only is this an effective marketing channel: studies in multiple countries have shown that over 90% of the recipients open this kind of publicity folder. And they are actionable: people use these folders to make shopping lists. And Aldi may have perfected this: I receive the Aldi folder on Monday morning. That’s the day after the weekend, when people might have spent too much money, making them cost conscience at that specific moment. The ideal moment for a discounter… The folder is not delivered in the large bundle of publicity folders I usually get mid-week. No, the Aldi folder is delivered by the mailman. Together with all the other important mail, making me notice it. Marketing budgets are, according to a survey by the CMO Council, around 8% of the turnover of a company. That’s a lot of money. That should be wisely spent, on actions that have a real impact. Not on the newest of the newest, trying to outsmart others. Studies, both by marketers and industry reports, should include the voice of the consumer, not just the voice of marketers themselves. Only then can we have an unbiased view of the effect of that marketing spending. And focus on what has an effect, focus on further improving what has an effect. An approach that is valuable for consumers, for the company and the shareholders of the company. UPDATE 30/11/2017: here is another interesting example, from the CMO Council about customer feedback and specifically consistency in packaging. 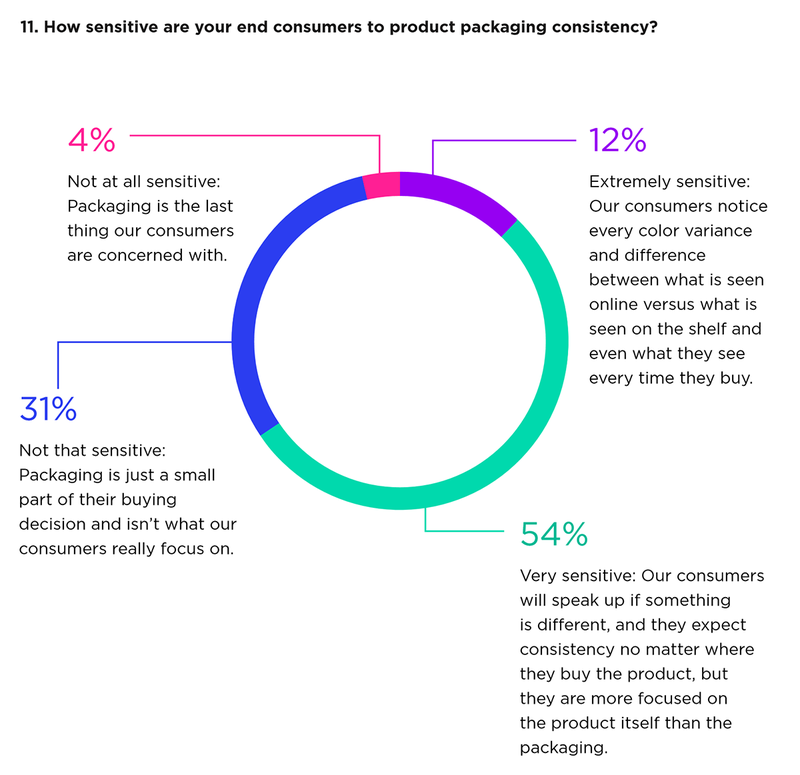 According to brand owners, their customers are extremely / very sensitive for (color) consistency in packaging. Maybe they want to believe that, but in real life (i.e. the supermarket) it’s different. With our color memory being very poor, small color variations don’t matter. Please read this blog post: the uncertainty principle of visual color evaluations. Like it? Share it! Right now! The printing industry has changed significantly over the last few decades. And that change isn't over yet. Eddy Hagen has been observing all these changes from a front row seat, since 1988. He has seen and debunked hypes that still don't deliver. He has seen and promoted small evolutions that had a big impact. He has connected the dots to get a better view. Eddy Hagen is an independent mind who might be able to give you the insights you need. Be the first to comment on "Marketing: a disconnect between marketers and their customers, consumers?" Get an update via e-mail when new comments are postedGet notified of new comments on this post. If discussion generates more than a few emails daily your subscription will be paused automatically.